So long as the Habs remain somewhat healthy, they’re on pace to once again challenge for a playoff spot as a bubble team. Yes, the old stomping grounds for the “Eighth is the new first" mantra, the result of 20 years of reduced expectations. My expectations going into the season was a 9th place finish in the East, with a tie-breaker’s chance of a playoff spot. The bellwether signs for improvement beyond that were, for me anyway, pretty simple; improved even strength scoring differential, especially on the road, better discipline and a deeper pool of NHL-ready depth to sustain injuries. So far, only the Flyers have taken more penalties than the Habs and they’re on pace to score even fewer ES goals than last year. What’s kept them afloat is their unhealthy dependence on the power play, which generated 41.2% of total offense (good teams are closer to 20%) in Q1, thanks to an unsustainable 5.5 power plays per game and a cherry home schedule to start the season. That bought the Canadiens time but it’s about to run out. League-wide, team power plays are now down to 4.14 per game and they will surely end the regular season in the area of 3.5. If Michel Therrien can’t get his 1st line of Desharnais, Pacioretty and Cole going, scoring even less at ES than last year is going to bite the Habs hard once the number of power plays returns from the stratosphere. In terms of depth, the bottom quarter of the roster is much better defensively than last year but there's almost no offensive upside. That, combined with 1st line struggles is putting extra pressure on the Galchenyuk line to pick up the slack when any offense they provide should be considered a bonus. 10th – Goals scored per game (2.83), 16th – Goals against per game (2.67), 14th – 5v5 ratio (1.11), 9th – Power play (21.2%), 17th – Penalty kill (81.0%), 13th – Shots per game (29.6), 12th – Shots against per game (28.1), 28th – Faceoffs (45.6%), 3rd – Total power play time (102:02), 27th – Total penalty kill time (96:24), 29th – Total penalties (92), 20th – Blocked shots (169), 11th – Most shots missed ( 150), 12th – Hits (296), 16th – Takeaways (75), 7th – Most giveaways (110). Healthy wingers does the body good. The Habs best two-way forward is back, playing in all situations against top lines. What’s hidden in that 46.5% on faceoffs is the fact Plekanec is winning 59.1% of his D zone draws. He’s also getting it done on the PK, leading the Habs in SH TOI and has been on the ice for just 2 5v4 goals against. Plekanec should be packed in bubble wrap between games because only the loss of Carey Price would be more devastating; given the load he’s asked to carry. One of the best moves Therrien made in Q1 was pulling the 34 year old off the PK. Gionta has lost a step of burst acceleration but remains willing to pay the price by driving the net. Gio needs to average at least 3.5 shots a night to be successful but he averaged just 2.4 in 31 games last year. Through Q1 this season, Gionta is averaging 2.6 which would be good enough for about 22 goals and less than 45 points over 82 games. With one more year to go on Gionta’s contract, time is limited to find out if Gallagher will be ready for top 6 minutes. Luckily, RW organizational depth is one of their only strengths so Danny Kristo is Plan B with Sebastian Collberg further out on the horizon. Meanwhile, enjoy what’s left of Gionta’s time in Montreal. Back where he needs to be; driving the net on line rushes and screening the goalie after retrieving pucks along the boards. For a guy that depends on pucks deflecting off his body for 25% of his goals and off his stick for another 25%, all within 5 feet of the crease, Bourque’s renewed interest in Montreal has been the biggest and most pleasant surprise through Q1. The question is whether he can remain invested all season. So far, Bourque looks a lot more comfortable and pucks have stopped bouncing over his stick as a result. RFA season isn’t the ideal time to slump but Desharnais ended Q1 with 1 point (a goal) his last 5 games, going -6 in the process. The equivalent of a 50 point player on the road last year, Desharnais had no points in 4 Q1 road games. Off the rush, Desharhais has been a disaster, relying on his wingers to get the puck through the neutral zone, usually involving a dump and chase to try and get it back while he makes his way to the net. On set plays, he’s been slightly better, winning 53% of his O Zone faceoffs in Q1. The problem there is that no Habs center has been thrown out of the faceoff circle more than him. Still, for a player struggling to generate offense for himself and his linemates, nobody took more offensive zone faceoffs than David Desharnais. Apologists looking to pass blame might want to chew on that stat for a bit because Therrien is giving him every opportunity to turn it around. Getting less than 14 minutes a night with two rookies like Galchenyuk and Gallagher isn’t going to turn Pacioretty back into a sniper. Then again, Desharnais hasn’t done nearly enough to set Pacioretty up either. Ultimately though, nobody can take bigger blame than Pacioretty for his lack of goals. Good snipers use their wrist shot the most and get in position to use it from under 30 feet away in 5v5 play. Patch has an excellent wrist shot but got away using it from 38 feet away last year. This year, he’s averaging 40.5. If he wants to start scoring again, Pacioretty must be more willing to get into high traffic areas and stop being a perimeter player. A 48 game season isn’t the ideal situation for a notoriously slow starter like Erik Cole, who has just 1 point (a goal) his last 7 games. If his track record holds up, Habs fans will have to wait for the 2012-13 season for be 1/3 over before he starts to warm up. I remain confident it’ll happen but the larger problem is bridging the time until then. Cole isn’t shooting enough or close enough to score consistently with average shot distance almost 10 feet further out than last year. Driving the net and getting him the puck in close has been a major problem so far and what was a road problem last year has become a challenge on home ice as well. After a hot start, thanks mainly to well-managed minutes on home ice, Galchenyuk hasn’t scored a point his last 5 games and had no road points in Q1. Chucky isn’t hurting the Habs defensively during the slump but it’s a huge ask to hope, let alone expect a raw rookie to replace the offense missing from Desharnais, Pacioretty and Cole. Meanwhile, pundits are seeing just how difficult it is to win enough faceoffs to warrant top 9 minutes at center. Therrien has been careful, limiting Galchenyuk to just 13 D zone draws, most being the result of icing the puck where winger Brandon Prust has been asked to take the majority of the faceoffs. Chucky’s TOI will largely depend on whether he can improve on his FO% over the remainder of the season and start producing on the road, against better players than the mixed bag he’s struggled with so far. Gally and Chucky have bonded well and should make an excellent scoring pair for years to come. Gallagher remains fearless and drives the net at every opportunity, traits that got him from being a 5th round project pick in 2010 to The Show. While his shooting % should trend down a bit over time, there’s much to like about Gallagher using his quality wrist shot almost exclusively and in tight, averaging 27.5 feet. Like Galchenyuk, TOI going forward will depend a lot on how they progress away from the Bell Centre but for now, they and the PP bought time for Desharnais, Pacioretty and Cole to get their act together. Hockey is a game of adjustments so with 2 points (both goals) in his last 7 games and just 1 point (a goal) on the road so far this season, Gallagher needs to find a way to deal with NHL calibre checking to average more than 11:00 a night. He’s been everything I hoped for when the Habs signed him last summer. A tough yet versatile team player with most of the attributes I saw in Travis Moen when he first came to Montreal. Just being a scrapper isn’t good enough in today’s NHL, which is why I liked the Prust signing. He plays on the 2nd PK unit which helps preserve Gionta’s legs and he can play on a higher line in a pinch. While he’s played with Galchenyuk, Prust has done a good job taking most of his D zone faceoffs to minimize scoring chances. Teams need versatile, disciplined foot-soldiers who help create space for others and Ryan White should be buying him steak dinners to learn his tradecraft. Eller is a better center than he is a winger but he’ll never be the top 2 center everyone hopes he’ll be unless he gets closer to 50% on faceoffs and gets a proper shot with offensive players to see what he can do. 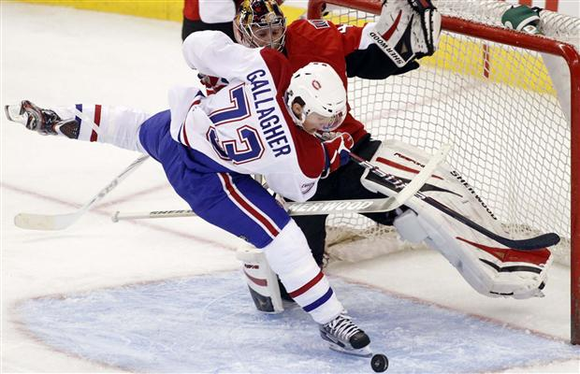 Eller won 42.4% of his faceoffs the first year in Montreal, 46.6% last year and 47.6% through Q1, while taking fewer draws than Alex Galchenyuk. I’m hopeful Eller will improve on what everyone would agree was a rocky start under Therrien and for the Eller haters who complain about his weak offensive numbers, it’s hard to put up points from a checking line where just 19.5% of his faceoffs come in the O zone. Eller needs a string of games with Pacioretty and Cole before any major decisions are made about his future in Montreal. Folks love to talk about the Habs PK% but won’t credit one of the two forwards (Plekanec being the other) most responsible for the penalty kill going from 12th to 7th to 2nd best in the NHL since he arrived in 2009-10. Through Q1, Moen has been on the ice for just 2/9 5v4 goals against, 1 5v3 and 1 6v4. Meanwhile at ES, Moen has been playing harder minutes each year he’s been in Montreal in a shutdown role. Moen is no longer the middle-weight he was in Anaheim but he’s still hard to play against, good for 7-8 goals over 82 games and gets better in the playoffs. Not bad for an affordable contract. Armstrong is only here because he was deemed more useful than the likes of Palushaj, Engqvist, Blunden and Staubitz on the 4th line. If Ryan White, Petteri Nokelainen and/or Louis Leblanc could have proven they were healthy or ready enough, Armdog wouldn’t have been claimed off waivers in the first place. At some point this season, I expect him to go back on waivers or be traded but until then, Armstrong will continue to play limited shutdown minutes against solid opposition and work on the PK. As for his offensive game, what little I thought he had left is now long gone. Here’s the thing about 4th line energy players with no offensive upside; they’re very replaceable. Until White learns some discipline or starts self-medicating with Ritalin via a PEZ Dispenser, Therrien won’t be able to trust him in tight games. A good energy guy will more often than not, take someone with him to the penalty box or get his team a power play from the retaliation but White has struggled to do any of that. As a fighter, he’s got a lion’s heart but White takes such a beating in the process, he reminds me of The Black Knight in Holy Grail. His teammates love him and with decent PK ability, just one ounce of discipline would make Colby Armstrong irrelevant. After an incredibly hot start, Markov had just 2 assists, both on the power play the last 6 games of Q1. I got some grief for saying Markov had lost some lateral and backward mobility in my season preview but it’s becoming more evident as the season moves along. Markov still has an excellent, offensive set of tools but must rely on better positioning to remain effective defensively. He’s struggled a bit with Alexei Emelin in the D zone, especially on the PK so I would prefer it if they were the 2nd PK pairing instead of the 1st, allowing Gorges and Subban to do what they do best. Still, every healthy day is a good day for Andrei Markov and the Habs. Those footprints you see on Andrei Markov’s coattails belong to Raphael Diaz. Of his 9 points in Q1, 7 were secondary assists with only 1 coming in his last 6 games. As an offensive support player, Diaz has clearly beaten out Yannick Weber and more importantly, Tomas Kaberle for 3 million fewer dollars. Diaz had difficulty on the road last year handling power forwards around Carey Price so it’ll take more than 4 road games to know if he’s any better this year. With just 7 hits in 12 games, Diaz still plays more of a positional game than a physical one but he remains a dedicated shot blocker. Based on most expectations going into the season, Diaz has exceeded them so far. Unless Subban is dealing with an undisclosed injury or is behind on his conditioning, there’s no valid reason for Michel Therrien to be feeding P.K. ice time through a hamster’s water bottle. 6th in ES TOI/G, 6th in SH TOI/G and 5th in TOI/G on the Habs when he proven capable of 1st pairing minutes in all situations? I’ll hold off on speculating that this is an ego play by Therrien because it’s only been 6 games but his TOI is certainly something to keep an eye on, as are the decisions to play others over Subban in key moments when a goal was needed. On the PP, Subban and Markov looked fantastic whenever they were together so I expect to see them as the 1st PP pairing in Q2. For a guy that stepped into the lineup just 5 days after signing a 2 year contract, Subban has looked solid. Now Therrien just needs to take the reins off and be a teacher after the occasional mistake, not a head master looking to make an example. At 37 years old, Bouillon averaging 6th among Habs D in TOI/G makes perfect sense. After struggling on the PK the 1st 4 games of the season, Bouillon hasn’t been on the ice for a PP goal against since. As a 1 year stop-gap, Soup has done a good job buying time for Jarred Tinordi, Nathan Beaulieu and Morgan Ellis to develop in Hamilton. He’s a durable and dependable depth defenseman and has been delivering on what was expected from him. Gorges is once again leading the team in Corsi Rel QoC, logging more hard minutes at ES and on the PK than any other Habs D. He’s also tied for 2nd in the NHL in blocked shots. Gorges started the year paired with Bouillon and it didn’t go well with 3 quick PP goals against. The switch to Diaz was made in Buffalo and in the 3 games since, Gorges and Diaz have been on for another 3 PP goals. At some point the experimentation needs to end with Gorges and Subban reunited. Until then, Gorges remains rock-solid at ES in a shutdown role. I would hope that by now, the fancy stat folk who once thought Emelin was one step below Andrei Markov in offensive ability have scrubbed their blogs and social media accounts. At 26, Emelin is entering his prime years and can still learn a lot from Markov. The two struggled together in Q1, especially on the PK where Emelin was on the ice for 6 PP goals against while Markov was on for 5. Some call it growing pains but as I see it, the pair are better suited to be the 2nd PK pairing, behind Gorges and Subban… assuming Therrien smartens up and reunites the pair in the near future. Emelin is averaging 2.5 minutes more ice time than last year and ended Q1 an even player after finishing last season -18. Cause and effect of learning when to go for the big hit and more importantly, when not to. Still, his 47 hits in 12 games puts Emelin 2nd in the league, with 2 less games played. For a D group that collectively isn’t very physical, Emelin has been a huge help and is being leaned on heavily to help cover for the loss of Hal Gill. So far, so good. 6 games, 1 secondary assist, 2 hits, 7 shots on net for $4.25 Million dollars. What bothered me… okay… pissed me off about the Kaberle/Spacek trade fallout was the faux argument Kaberle was a better offensive player than The Pigeon and that he’d be a tradable asset during the off-season. The first part was never even the issue. The problem many of us had at the time of the trade was the TWO MORE YEARS AT 4.25 MILLION that were attached to his bloated carcass contract and how it was going to limit the Habs going forward. Without 2 amnesty buyouts in the new CBA, the Canadiens would have been royally screwed so fortunately, they just need to get through this season to undo Gauthier’s mess. As for being a tradable asset, the Habs found no takers. And yes, they tried. The summer looked somewhat promising; Kaberle worked with Karel Svoboda (yes, Petr’s brother) on the West Island before going to Kladno in the Czech Extraliga during the lockout where he put up 6 points in 10 games. It didn’t take long for regression to the mean and uninterested Kaberle returned. During the Habs 6 day mini-camp, Kaberle was soundly beaten out by both Bouillon and Diaz on the depth chart. The Habs would gladly trade Kaberle but the most likely scenario is a buyout this summer, unless of course Pierre Gauthier gets another GM job or Marc Bergevin is prepared to take a bad contract in return, which I doubt. Weber is the poster child for defensemen who float around the bottom of NHL depth charts in the cap era. Young and cheap has replaced aging, more expensive vets with a bit left to prove as an insurance policy vs. injury. Diaz beat him out of a job last season and hasn’t looked back so for Weber, his time in Montreal is finally running out. A decent puck mover with a great shot who gets man-handled down low, he’d probably do okay in the Western conference. The way things have gone for him in Montreal, I wish him the best. Now that Price is in the 1st year of a 6 year contract averaging $6.5 Million, the 3rd highest cap hit among active goaltenders , expectations are that he finally plays like a Top 5 goaltender in the NHL. Through Q1, Price’s GAA was 10th best among goaltenders with 5+ games and was 13th in SA%. Those stats are bloated a bit because the team that plays in front of him remains one of the most undisciplined teams in the NHL since he broke in during the 2007-08 season. Elite goaltenders today have a SA% in the area of .925 and Price so far has come close to that number only once. Penalties taken and the health/quality of the defensive shield can greatly impact the most commonly used stats to judge goaltender performance. Looking at his 5v5 GAA through 10 Q1 games played, Carey ranks 7th best (1.59) among goalies with 5+ GP, tying his highest career ranking, achieved in 2010-11. Now he needs to maintain that level of play when they spend more time on the road. Meanwhile, that excellent 5v5 GAA has hidden the fact the Habs are on pace to score even fewer ES goals than last year. Veteran backups that don’t mind playing about every 3 weeks or so, who can remain sharp and focused are hard to find. It’s certainly not the place for a young prospect, unless there are great concerns about the starter. Budaj won’t be back but there’s nothing in Hamilton that’s any better, even with the arrival of Dustin Tokarski. Marc Bergevin commented on the organizational weakness in goal soon after he was hired and I expect that will continue to change between now and next season, with a top 3 round pick likely being used on a goaltender at the draft.